Are you looking for something a little different? Chris has transported thousands of people to the wildest places on earth in their minds through his world-class live presentations. They combine adventure, laughs, inspiration, and stories from the wilderness that will stay with you forever. All told through stunning photographs and film clips. Above, Chris talks about his grizzly bear capture experiences! 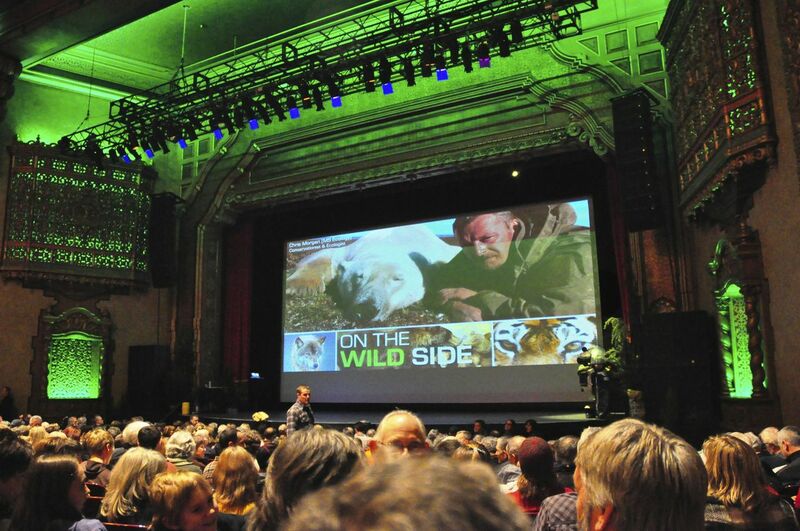 Chris’s live show to an audience of 1100 at Mount Baker Theater, Bellingham, WA, USA. Chris Morgan’s keynote presentation at the Alaska Society for Technology in Education (ASTE) conference was nothing short of amazing! Chris’s stories about research and filmmaking in bear country in Alaska, Peru, Borneo, and Canada was exciting, educational, and had our audience wanting more…..especially the upcoming Bear Treks work. Chris taught us the expression of “harnessing the goosebumps” – the thrill and excitement going on in his different projects. What we learned is that Chris’s presentations created an “avalanche of goosebumps” for the audience. AND Chris’s descriptions of other film he’s made such as the Siberian tiger really taught us the key to Chris’s filmmaking is his terrific patience and listening skills. More than anything else, one comes away from Chris’s presentations with the strongest sense, a deep and abiding respect for his passion, his curiosity and his wonderful focus on conservation through bear research. From the thrilling excitement of his work in filmmaking across the world that he shared at our ASTE Conference, Chris gave us a real sense about what is possible with learning in nature and technology – the theme of our conference. Whether dressing up in the playful bear costumes that we provided, teaching us how to engage in a wolf howl, or simply being present amongst the attendees listening to the Alaskan educator stories across the state, Chris really brought home the fact that researchers and filmmakers in Alaska (when they’re motivated and as goodhearted as Chris) really can work with educators to make sure their work for the protection of wildlife come home to rest in the minds and hearts of children. Chris Morgan is leading what may be the most important global environmental movement of all time and I got the opportunity to hear him speak this morning at ASTE 2014! His work is dynamic, and so transparent for the average human to not only get, but FEEL. Spread the word about this incredible video that does more transparent and engaging education on the subject than I’ve ever seen. Chris, I think it is great that you were at this event because you crossed boundaries – you reached an audience that you might not otherwise be able to talk with. How unique to use your well-traveled and trusted BMW motorcycle as a talking stick for bears and bear conservation. Ingenious! I imagine that folks were surprised to see you there, but captivated by your passion for your work, your credibility in speaking on behalf of bears and other wildlife, and your humbleness. I’m sure your presence was enlightening and changed the way some will relate to and/or think about bears in the future. Thank you Chris for your efforts toward helping us learn more of wildlife and your appreciation of our furry friends. Thanks Chris to you and Brenda for sharing your insights with us nurses re Adventure Biking and Humanitarian work in Africa. I have to tell you about our plans after being at the IMS on Sunday. It may very well be life-changing and you inspired it. The evening was an absolute home run… ending with an enthusiastic standing ovation and howls of appreciation. No really, actual howls. Chris had us all howl like wolves during the show, and during the ovation people started howling their appreciation for Chris. Chris was visibly touched by the outpouring of love, but the 1,100-strong crowd was even more touched by the moving and engaging experience they received from Chris. Just as billed, Chris had us all laughing one minute, choked up the next, and the whole time thoroughly engaged and entertained. It was a fantastic mix of clips, anecdotes, humor, science, etc. The true testament of how good Chris’s show was was that my 7- and 10-year olds and their friends, who were all sitting with me, were TOTALLY and COMPLETELY engaged the whole entire time. Believe me, this is no small feat! It was an unbelievably GREAT show. One for the memory books. Exceeding ALL expectations! Chris is a class act and exceptional at what he does! I have an old friend that was well known in the performing arts world outside of Bellingham, he used to say it was tough to “be a hero in your hometown”. That is NOT the case for our hometown bear biologist Chris Morgan this afternoon. A much loved ROCKSTAR, from opening to close. Thanks for a special show for your fellow ‘hamsters. Delightful, engaging and moving. Just had to tell you how much I enjoyed your presentation – clearly everyone else did, too, since you got a standing ovation! I brought my 11 year old next door neighbor with me and she was absolutely entranced by the whole thing. I wanted to stay after and say hi (and get you to sign a book), but I had a dinner date and had to go. I’m so glad I got to see you, though. You are truly an inspiration, and I am so happy to see all your dedication and hard work turn into such a success. (I tell everyone you are the next David Attenborough). Can’t wait to see Beartrek! A colleague and I were thrilled to be in your audience in Bellingham on Sunday. It was a truly engaging and moving experience. I am so proud of you and the people you work with, including “our” Robyn Appleton. You and your filmmakers are accomplishing incredible things with your treks to film the bears in their natural habitats. It is my belief that if we can build people’s fascination and respect for wildlife, they will be more likely to make good decisions. That’s what I try to do in this urban area when I make presentations and speak with people at community events. I can hardly wait until BearTrek makes it to the big screen. I will try to fill the movie house many times over on the North Shore! I attended your event last evening at the MBT with my wife and son. We all were enthralled with your presentation, the videos were fantastic and your narration and story telling very engaging. My son is 8, he is half American and half Russian (my wife, Svetlana is from Novgorod) and he accompanies me on hikes in the North Cascades now, he loved the show and was very excited to see Grizzlies! I am a local photographer, from Sedro-Woolley and I am often aghast at the level of fear and complete darkness with which most people react to bears…your movies help to wake people up and enlighten them, and will hopefully aid in protecting our environment so that bears (and us!) survive. So, you are now one of my heroes, my hats off to you and what you’re doing! I hope to run into you some day up on Easy Ridge or Tapto Lakes or on the North Fork Bridge Creek Trail… thanks again for an exciting evening! …My girlfriend and I had a blast! Your show ran soooo smoothly and the attention to detail with your presentation was very impressive! Don’t know how well you could hear the audience, but there were a few little kids sitting near me and they giggled so much throughout the show. Thought you might enjoy hearing that. While walking out of the theatre, I told my girlfriend that I want to quit my job and somehow make a living as a wildlife photographer and travel to wild places like you do. 🙂 You are very inspirational! Last night was an astounding success! Congratulations! You are the consummate story teller, and your love for the animals you work with is palpable in all you do. Really, wonderful – we can’t wait for Beartrek to hit the theaters. The Greatest Show on Earth (and for Earth)! Thanks Chris for reminding us that we are all one life and one love! “Conference feedback has been extremely positive and it sounds like your “Life on the Wild Side” presentation was a ‘howling’ success. According to my staff, you made quite an impression, and I appreciate how gracious you were with everyone, especially the children. I’m sorry I was unable to attend but am sure it was a presentation the audience will never forget, and that you instilled greater appreciation and respect for bears, wolves and other wildlife.